There is nothing sweeter than these baby animal cookies, all dressed up for Spring. Because the base is packaged sandwich cookies, you can get to the fun part -- decorating -- right away. Cloaked with Candy Melts and embellished with a variety of sprinkles, the whole family can enjoy making these tasty treats. Follow along to learn how to make cotton tail cookies, Nutter Butter chicks, bunny-eared chicks, and bunny face cookies. These silly cookies feature a sparkly marshmallow cotton tail and cute pink paws. Gather Oreo cookies, lollipop sticks, white Candy Melts, mini marshmallows, clear or white sprinkles and pink writing gel to get started. Gently twist open each Oreo cookie and set the top aside. Melt 1 cup of white Candy Melts in the microwave according to package directions. Dollop a small amount over the frosting on one side of each cookie. Carefully insert lollipop sticks into the frosting and reassemble the cookies. Hold the cookie over the bowl of melted chocolate. Using a spoon, pour chocolate over the top of the cookie. Turn over and repeat, using the back side of the spoon to smooth out any ripples. Drain off excess chocolate over the bowl. Place coated cookies on a sheet of parchment paper until set. Each cookie requires 1 1/2 mini marshmallows. Cut each marshmallow in half and place two halves with sticky sides down towards the bottom of the cookie to make the feet. Make four dots on each foot using the pink writing gel. Dip another half marshmallow's sticky side in some sprinkles. Dab a bit of the melted white chocolate to the smooth side, then place towards the top in the middle to create the tail, sprinkle side up. These Nutter Butters are coated in yellow Candy Melts then dusted with yellow sparkles. Fancied up with jumbo daisy & sequin flower sprinkles, they are almost too sweet to eat. Gather Nutter Butters, yellow Candy Melts, lollipop sticks, jumbo daisy sprinkles, sequin flower sprinkles, yellow sparkly sprinkles and mini chocolate chips to start. Insert sticks as previously described so cookies stand vertically. Evenly coat each cookie with 1 cup of melted Candy Melts (enough for about 10 cookies) and place on a sheet of parchment paper. Immediately coat with a thick layer of yellow sprinkles before the Candy Melts set. Decorate each cookie with two mini chocolate chip eyes, a sequin flower sprinkle mouth and a jumbo daisy sprinkle "hat" by placing a small dot of melted candy on the backs of each of those things then gently setting them in place on the cookie. It may be helpful to use tweezers for the small sprinkles and chocolate chips. These cute chicks are wearing their bunny disguises. Gather Oreo cookies, lollipop sticks, yellow Candy Melts, white Candy Melts, Jordan almonds, black writing gel and sequin flower sprinkles to begin. Insert sticks as described in previous steps. Melt 1 cup of yellow Candy Melts (enough for about 10 cookies) and coat each cookie on both sides, allowing excess candy to drip off. Place on parchment paper until set. Melt 1/2 cup of white Candy Melts according to package directions. Place two small dollops of white chocolate on the top of one cookie, where you want the ears to be. Hold a Jordan almond in each dollop until it sets. Repeat with remaining cookies. Spoon a small portion of melted white candy melts into a small zip-top bag and seal. Snip off a small corner of one end and pipe a band of chocolate across the top of each cookie to create the headband. Use two orange flower sequins for the feet and three yellow flower sequins for each wing. Attach by adding a drop of melted Candy Melts to the back. Cut an orange flower sequin in half and use for the chick's beak, attaching in the same way. Add two eyes with black writing gel. These smiling bunnies are fun to make and fun to eat. 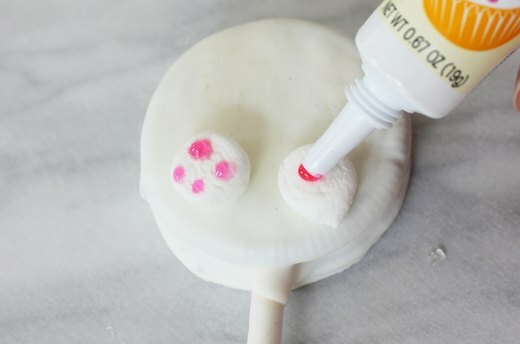 Gather Nutter Butters, white Candy Melts, pink M&Ms and a brown candy-decorating pen that works with Candy Melts. Insert lollipop sticks into the cookies as previously described, but this time the sticks should rest down the short side of the cookie. Melt 1 cup of white Candy Melts (enough to coat about 10 cookies) according to package directions. Coat each cookie on both sides with chocolate and allow excess candy to drip off. Place on a sheet of parchment paper until set. Dip the bottom of a pink M&M in a bit of white chocolate and place at the top of the cookie for the nose. Hold in place until set. Draw whiskers and a smile on each bunny face using the decorating pen. 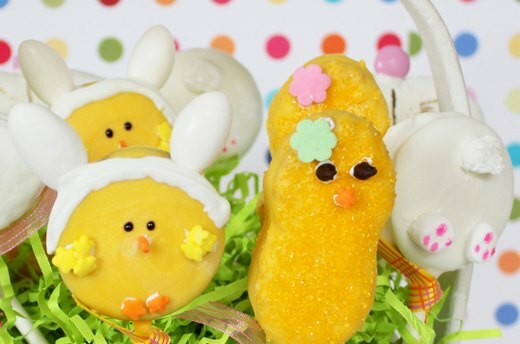 Assemble your decorated animal cookies in a festive Easter basket. Add paper grass and eggs for decoration, then present to a deserving friend or family member.